To those who are familiar with Samsung handset, I mean Android device, KNOX is an interesting feature among all Android OEMs. For some Samsung handset owners, you could not bypass KNOX in rooting your phone. However that’s not the topic I am going to discuss in this post. There are a few points to make clear before we go into details. 1. You could not check USB debugging in settings once you install my KNOX. 2. You could not capture screen (or take screen shots) in KNOX. 3. You could not tell the difference between KNOX and Android except the lock icon. To my best knowledge, KNOX is an independent OS in Android, you can run both at the same time without interfering each other. By independent, I mean they are isolated. You can not copy items from KNOX to Android, or the other way around. And, you can run the same app in two system independently too. That is, two same processes, the very same app! However, the notifications for your KNOX apps will appear in Android notification panel. Download it from Samsung app store if you do not have it installed yet although Galaxy phones come with it pre-installed. Please note you also need to register a Samsung account to sign in and use KNOX, and the password should not be the same with the one you use to unlock your handset. In order to enhance the security of the system, the password should include letters, numbers, signs. otherwise the registration could fail. Once you install it. Make sure the KNOX process should not be terminated by any security apps. 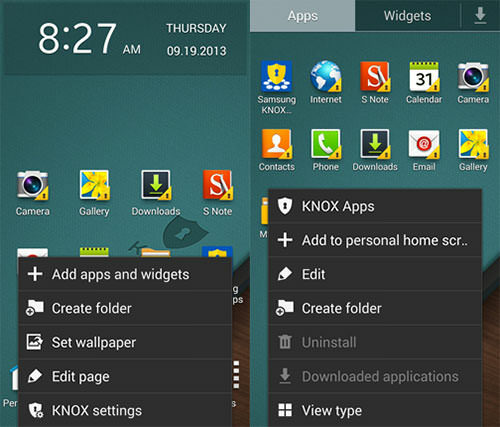 To use apps in KNOX, you should install an app in Android first before you can add it to KNOX. You can delete that app from Android later when you add it to KNOX. If you want to delete it from KNOX, just remove it. To use remote control or remove KNOX from your cell phone, log on to samsungknox.com. If you want to remove my KNOX, well you could not do it on your handset. Actually you need to logon to samsungknox.com and select uninstall it. Other functions include lock your handset / KNOX, unlock KNOX and reset the password. Please let me know your thoughts about Samsung KNOX on my Facebook page here. © 2016 Bluetooth,WiFi,GPS Cell phone tracking. All rights reserved.